Wednesday June 3 1908 I put out some tomato plants this morning as it was cloudy. Mother called me about eleven oclock telling that Uncle George died last night. I went down there after dinner for a call. stopped at home and at Woolfs and got home at 5.39. It was late when I got my evening work done. The boys plowed corn. Thursday June 4 1908 I got my work done up as early as possible. Ida and Mary came out at 10.39. They had staid at Fannies last night. We had a good days visit as they did not go home till after supper. They boys plowed corn all day. I think my chickens are some better I wrote a short letter to Lydia. 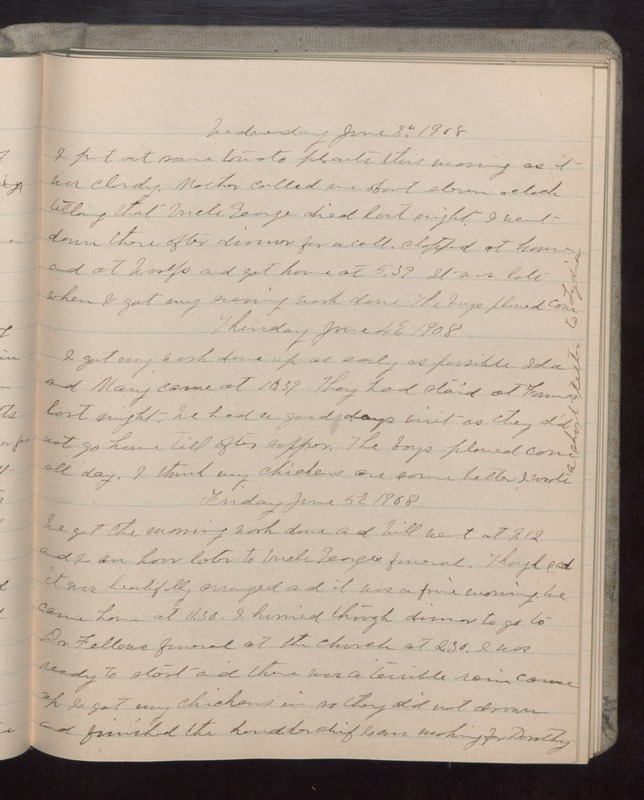 Friday June 5 1908 We got the morning work done and Will went at 9.12 and I an hour later to Uncle Georges funeral. Though sad it was beautifully arranged and it was a fine morning. We came home at 1.30. I hurried through dinner to go to Dr Fellows funeral at the church at 2.30. I was ready to start and there was a terrible rain came up I got my chickens in so they did not drown and finished the handkerchief I am making for Dorothy.